When the temperature begins to drop, the leaves begin to turn and the days begin to shorten, you know it’s pumpkin time again. 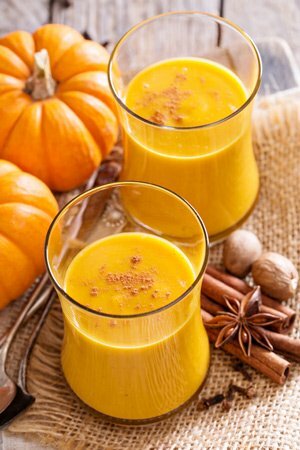 There are many ways to enjoy this delicious orange vegetable, but if you like your pumpkin in a glass, then why not try a pumpkin smoothie. 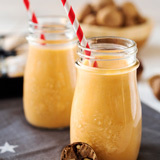 A pumpkin smoothie is also an easy way to satisfy those pumpkin cravings with less sugar and fewer calories than the traditional baked pumpkin pies, loaves and cookies. 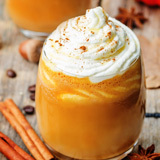 Canned pumpkin is readily available year round, so is a great time saver and has the same nutritional value as fresh. But there is no substitute for freshly cooked pumpkin, it tastes so much better. Fresh pumpkin is really only available in the fall and winter so whenever you get the chance, take the time and trouble to cook up a batch. My favourite method is to oven bake. It somehow seems to enrich the flavour. 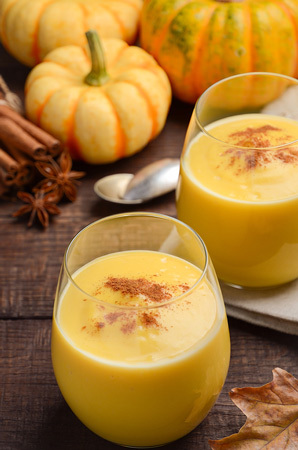 Once cooked puree the pumpkin using a blender or food processor. Spoon into jars, cover with a lid and store in the refrigerator. I recommend using within 3 - 5 days. Any surplus can easily be frozen. Spoon into suitable storage containers. A great trick is to use ice cube trays. Once frozen, remove the pumpkin from the trays, then place into freezer bags and seal. 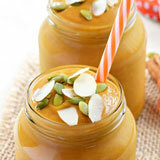 You now have small serving size pieces of pumpkin to throw into your blender. 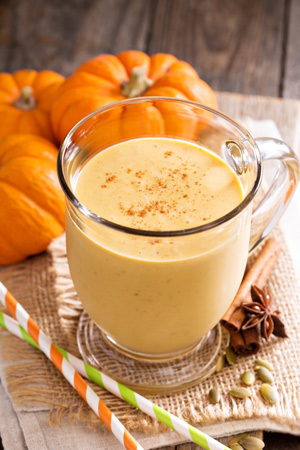 Place the cooked pumpkin, yogurt, almond milk, turmeric, cinnamon and almond butter into your blender jug and blend on high until smooth. Peel and segment the orange. 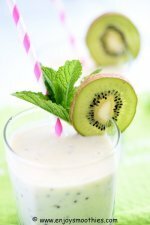 Add the orange segments, cooked pumpkin, banana, yogurt, orange juice and grated ginger to your blender. 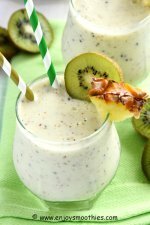 Turn up to high and whizz away until your smoothie is this and creamy. Pour into your favorite glasses. This makes two glasses. When adding the ginger, start with ½ teaspoon then add more if needed. Fresh ginger has a strong taste, and it can very easily overpower the other flavors. 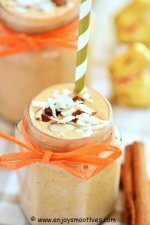 Whizz together the pureed pumpkin, frozen banana, peanut butter, almond butter, almond milk, nutmeg and cinnamon until smooth and creamy. (How much peanut butter you use depends on personal taste, but I ended up adding 3 tablespoons to get that peanut butter flavor).